So what does your entry door latch look like anyway? Something like this maybe? Be honest, if your latch is original, then this installation may interest you. You could say hey, what’s in tightening down four 3/8″ hex nuts? Ah, you are assuming you can get one AND that it will not leaks when it rains. Both of these assumption make replacing the entry door latch a bit more work. First, you need to get one, no– they are not carried by your local parts house, matter of fact it is no longer available in its exact form at all. We do have them new but the new model is missing the inner latch pin. 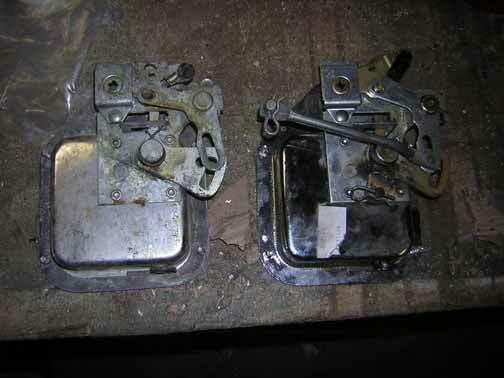 So, your original latch (the one on the left) must give up its inner latch pin to have it spot welded into place. We do offer swapping this pin for you and make a brand new latch for you for $75. 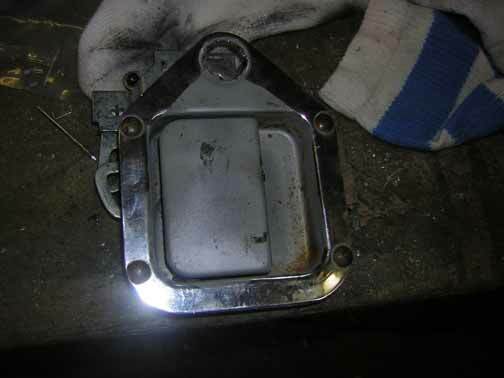 Yea, I know it sounds high but what can I say, I have to pay my guy to cut off and tac weld the pin! You could sand blast & paint the latch (I have done that with acceptable success). Take your choice, the only thing I will tell you is that if you do not do something to it, I don’t care how good you new paint job is, the coach will look OLD!!!! !